It’s the true story of the men’s 1980 U.S. Olympic team who defeats Russia for the gold medal (they hadn’t beat the Russian’s since 1960). 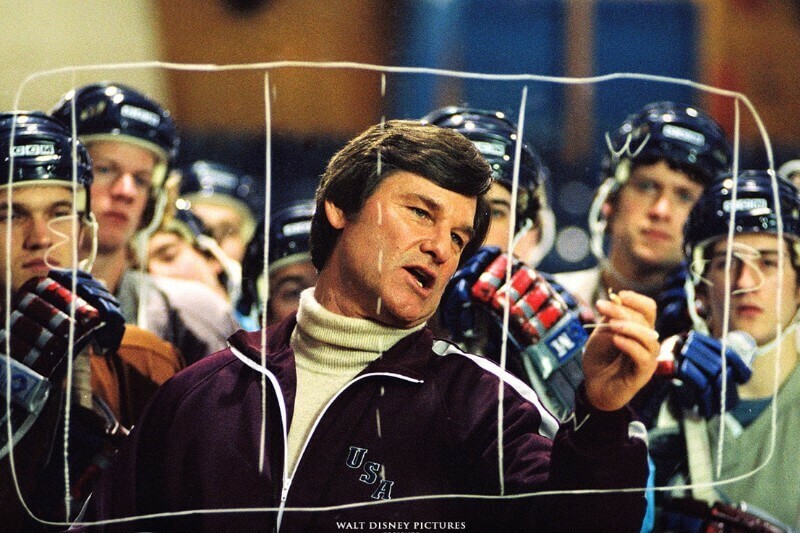 Kurt Russell did a great job as the coach, Herb Brooks. I saw this movie in the theater when it first came out (2004). I’m a sucker for inspirational sports movies. Another favorite, that I own, is the movie Rudy (not that I can watch it anywhere other than my laptop since I don’t own a DVD player anymore… should probably buy the digital version on Amazon) and have watched it more times than I can count (I also listen to the soundtrack on Spotify… all instrumental, beautiful music). I have my own set of ‘go-to’ things that I listen to, read, or watch when I can’t get out of my own way (the noise in my head). The challenge for me is that those are pretty much my ‘go-to’ things when things are flowing too. I make a very conscious effort to put things into my mind that makes me feel good (it can also be pure entertainment as well, such as all things Marvel. I love those movies). So yesterday I was a little extra emotional (it was the anniversary of my husband’s passing… 15 years. Hard to believe it’s been that long) and while I wasn’t trying to push the feelings away, I needed to shift my mind a bit. I wasn’t in the right mindset to work (and let me say that as I type this I have massive gratitude for being able to take the space I needed yesterday) or do anything else productive… so I looked for a movie that would take me away for a bit. Not only was it inspirational, but it was a gentle reminder of a lot of things for me. Persistence, belief in what you’re doing, commitment, drive, and the bigger picture. This young team of college hockey players who beat the Russians didn’t realize they were also going to lift the spirits of an entire country as this was during the Iran Hostage Crisis (52 Americans were held hostage for over a year). So even in the most challenging times in my own life, life is still good. The fact that I can turn to something as simple as a movie (true story or fiction) to lift my spirits is a blessing. It’s way to easy in this online space to get caught up in our heads… what we could be doing, should be doing, who is doing better than us… it’s a little exhausting. Which is why I will always have my ‘go-to’s’ to help me shift my mindset. I shared that the new podcast is dropping this week (you don’t need to resubscribe, I’m changing the feed that is submitted to iTunes, but the subscription will stay the same). The format will be sort of similar to the old show (guest and solo shows), but I’ll also have shorter episodes periodically (the regular show will be weekly, the shorter episodes will be dropped whenever). However, the guest shows will be a little different than they were before. I’m still going to focus on digital entrepreneurs, but it will be less of an interview and more of a discussion around something specific (plus their backstory. I think there’s massive value in hearing the journey). Where we’ll be discussing, yes, you guessed it. Showing up. These shows will be added to YouTube after the FB live stream, but since more of my audience is on Facebook that’s where I’m going to host the show. I have a list of people to interview and have on the show, but I would LOVE to have your suggestions for guests for both. This isn’t about people coming on strictly as an opportunity for them. They have to be willing to provide massive value to my audience AND…. novel idea here, share the show. It doesn’t have to be a massive promotion. Even a simple social share will suffice. If you have someone in mind you think I should have on, just comment below or email and fill me in ([email protected]). In the meantime, it’s time for coffee #2!